Friday Freakshakes & Kung-Fu Burgers Are Now a Thing! Beefed-up burgers paired with jaw-dropping milkshakes – now that’s what we call love at first bite. Looking to ‘shake’ up your burger experience? From the spicy Kung Fu Burger to the extreme shakes, here’s a rundown of the newest additions to the TGI Fridays menu. A fiery creation that packs a spicy punch (we’re talking roasted jalapeños and Sriracha Aioli), this beef burger will bring out your wild side. Perfect for the ‘lunch after the night before’, this juicy beef burger comes with a fried egg, caramelised onions, Provolone cheese and pepper bacon. Ideal for an on-the-go snack, these mini burgers are a flavourful mix of corned beef, Swiss cheese, Dijon mustard and caramelised onions. Bringing those Texas vibes to the table, expect spiced burger sliders with melted Cheddar, red onion pickles and a delicious BBQ sauce. The perfect choice for chicken lovers, these crispy sliders are packed with guacamole, roasted jalapeños and Monterey Jack cheese. 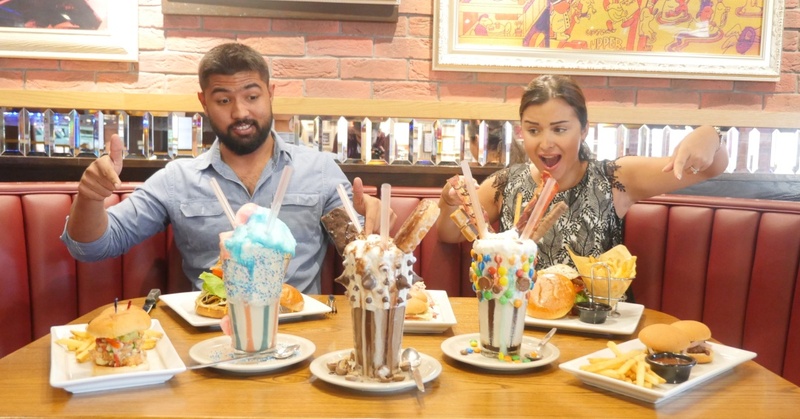 With all good things comes a sweet end… which is why we ordered TGI Fridays’ 3 new extreme shakes (…perks of the job, hey?!). The colourful Circus Circus came topped with a mountain of candy floss; the Whole Lotta Chocolate was a sinfully sweet concoction of maltesers, a donut and brownie; the vanilla-flavoured Salty Bog was served with an explosion of M&M’s and chocolate-covered beef bacon. Head down to your nearest TGI Fridays this weekend and meet the latest additions to the new menu!